Address Defaults – Set the default address that will be used when creating a new customer. Unique Ship To – Check this if you require each ship to ID to be different across customers. Contact Labels – Contacts 1, 2 and 3 can have a label added to define what the contact is used for; i.e. if you always want contact 3 to be used for accounts payable, then change the label to ‘Accounts Payable’. Terms – Customers default terms. Ship Via – Customers default shipping method. Taxes – Default taxes for a new customer. GL Account – Default GL account that will be used for a customer if the setting to override the inventory sales account is selected (below). 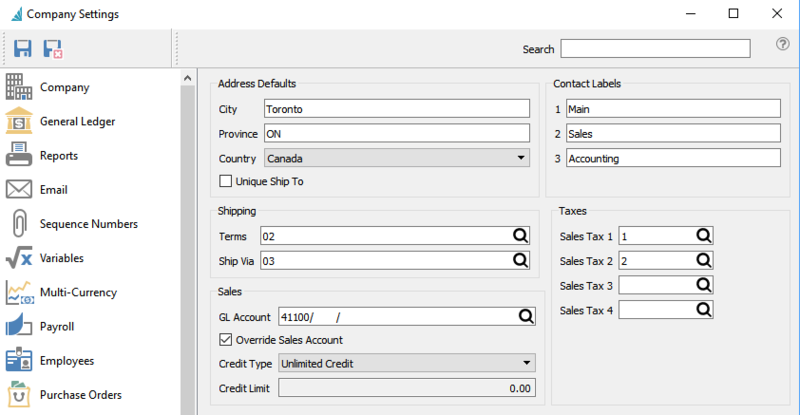 Override Sales Account – Use this to override the sales GL account selected in the sales department used for inventory items. Credit Type – Default credit type for a customer. Choose either No Credit, Unlimited or Limited. Credit Limit – Default credit limit for a new customer.